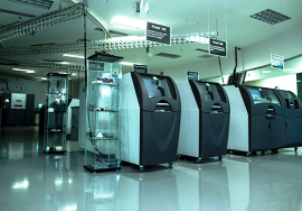 3D Systems, the leading provider of 3D printing centric design-to-manufacturing solutions, has announced a 200,000 square-foot expansion of its facility in Rock Hill, South Carolina, to meet growing demands for its 3D printers and materials. According to the press release issued by the company, the move is set to strengthen the company’s manufacturing and distribution operations. The new facility will be in full operation in the first quarter of 2015. “Our continued Rock Hill expansion underscores our commitment to localized manufacturing, demonstrating through our actions that what is designed locally can be built locally,” said Avi Reichental, President and CEO, 3D Systems. Aside from creating hundreds of new jobs at its expanded facility, the company also said that it plans to expand its research and development and engineering operations in the freed-up space of its current headquarters building. The centre is an interactive facility where products, tools, solutions and the endless possibilities of additive manufacturing are showcased. Those interested in job opportunities with 3DS should visit the company’s careers webpage at www.3dsystems.com/careers.